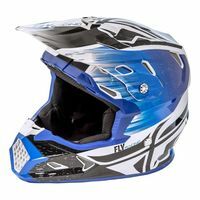 New for 2018, the Toxin Resin is FLY Racing’s new mid-level helmet created with high attention to detail, style and protection. The Resin meets both ECE and DOT standards and features an integrated MIPS® (Multi-directional Impact Protection System) as well as three unique shell and four unique EPS sizes for a precise fit. With its clean style and high level of protection, the Toxin Resin is sure to be a favorite with racers and enthusiasts alike. The MIPS Brain Protection System is designed to reduce rotational motion transferred to the brain from angled impacts to the head. Brain injuries originate not only from direct impacts to the head, but also from rotational forces resulting from impacts occurring at an angle. The MIPS technology is scientifically proven to reduce rotational motion by absorbing and redirecting rotational energies and forces transferred to the brain from angled impacts to the head. MIPS works by installing a thin (0.5–0.7 mm), ventilated, custom cut low-friction layer inside the helmet liner. The layer is held in place by an assemblage of composite anchors that flex in all directions. These anchors hold the layer in place, around the head, but provide a small movement in response to angled impact. $13 Promotional Gift Card available on this product! Need help choosing the right shape and size helmet for your own noggin? We’ll help you find the right fit!